1Lt William L. McKimmie (P) - Assigned 358th BS on 2 February 1945 - Stayed behind in the USA when his crew was transported from the USA to Molesworth. Obtained an emergency leave to be with his wife and attend the birth of his child. Was transported to Molesworth after the birth. 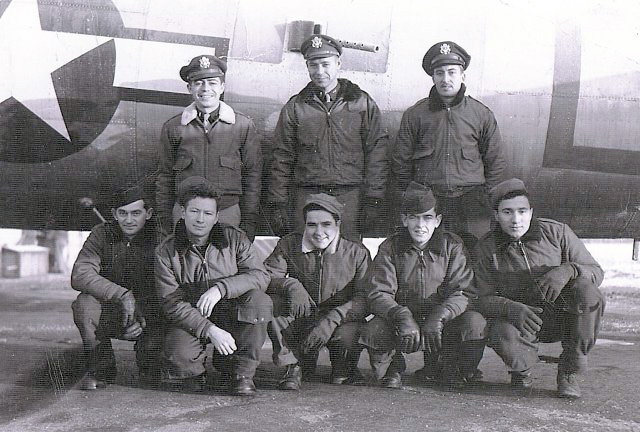 Other original crewmen: Assigned 358th BS on 24 December 1944 without their Pilot. 2Lt Frederick E. Wilhelm (N) - Original assigned Navigator. Flew one mission (#334 - 11 March 1945) with the McKimmie Crew. Flew on fourteen missions with other Pilots: 299 (8 Jan 45), 311, 314, 315, 319, 320, 323, 324, 326, 327, 350, 355, 359 & 364 (25 Apr 45). Ten different substitute Navigators used on Lt McKimmie's missions including F/O Junius Leonhirth on five missions (315, 316, 320, 321 & 323). T/Sgt Evert L. Farmer (E) - Flew with Lt McKimmie on nineteen missions. Substitute Engineer used on two missions (319 & 358). Flew with other Pilots on two missions (299 & 308). T/Sgt Robert E. Kilroy (R) - Flew with Lt McKimmie on eighteen missions. Substitute Radio Operator used on four missions (319, 358, 360, 364). Flew with other Pilots on two missions (299, 344). 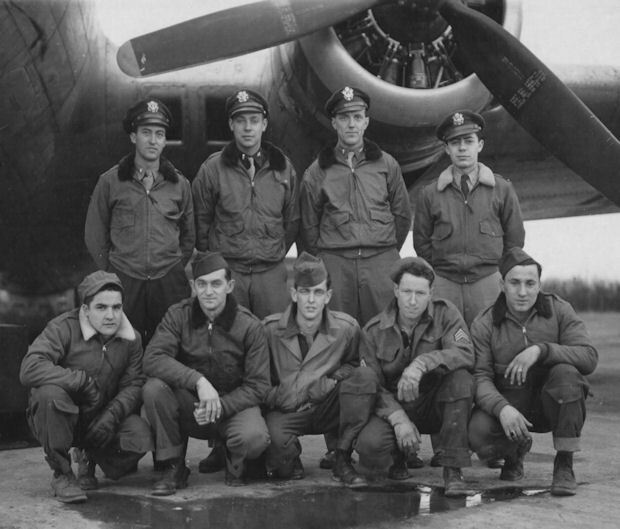 Sgt John E. Mogusar (TG) - Flew with the Lt McKimmie crew on twenty missions. Substitute tail Gunner used on two missions (320, 360). Flew with other Pilots on ten missions (299, 301, 308, 310, 311, 313, 314, 354, 355, 356). 2Lt George W. Jones, Jr. (B) - Original assigned Bombardier. Flew two missions (343 - 22 Mar 45 & 347 - 28 Mar 45) with the McKimmie Crew. Flew on ten missions with other Pilots: 299 (8 Jan 45), 314, 316, 324, 327, 328, 334, 335, 339 & 356 (9 Apr 45). Substitute Bombardiers or Toggliers used as replacements for 2Lt Jones. S/Sgt William R. Scott (WG) - Waist Gunners were used only on nine Lt McKimmie crew missions (315, 326, 318, 320, 323, 327, 358 & 360). S/Sgt Scott was reassigned as a Spot Jammer (SJ) and Radio Control Measures (RCM) crewman and flew on 25 credited missions in these positions with other crews. Flew one mission (#347 - 28 Mar 45) as Spot Jammer with the McKimmie Crew. Mission #348, 30 March 1945 to Bremen, Germany - Lt McKimmie, flying as Deputy Lead Crew, took over the formation lead when the Lead Crew in B-17G 44-8484 (No Name) was shot down by flak. Maj or Glynn F. Shumake was flying as the Air Commander in the downed B-17. Mission #364, 25 April 1945, to Pilsen, Czechoslovakia - Gunfire from the chin turret, operated by Bombardier, 2Lt Charles A. Bradshaw, in B-17G #43-39450 (358BS) (VK-P), Piloted by Lt McKimmie, accidentally hit B-17G #43-38191 Shasta (358BS) VK-A piloted by 2Lt Ernest A. Bailey. The #2 gas tank and radio compass were damaged. An emergency landing was made at field R-24, Werzberg, Germany. The nine man crew returned to Molesworth a week later. The B-17 was salvaged in Germany.